I'm pleased to introduce you to my new leaf plate. I bought it this weekend at The Village Pottery in New London, PEI, but it now lives in its new home on my coffee table in Toronto. We were lucky enough to spend 5 spectacular days on the Island recently. It was so wonderful. I have much more to tell you about the trip. If you follow me on Instagram and Twitter you already know I microblogged the heck out of the trip. But back to the leaf. This lovely thing is the work of Suzanne Scott, who is better known around the social media world as The Potter's Daughter. 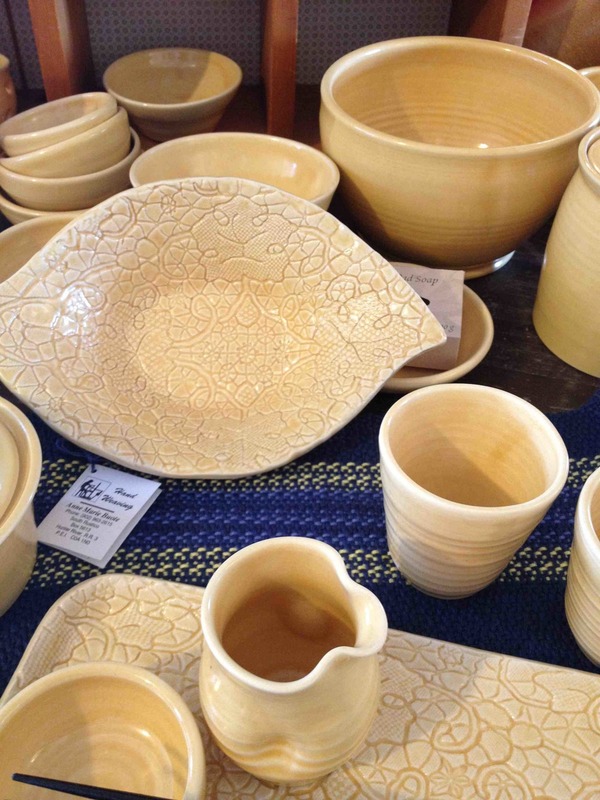 It was great to meet Suzanne and to see all of the wonderful handmade pottery in the shop. Despite the fact that I seriously need to be in purge mode rather than acquisition mode -- I could not resist. I suppose my leaf could be for sushi or an appetizer or something. But for me it's that perfect little objet that every stylist needs to put on top of a book. In this case Else de Wolfe: A Decorative Life - such a pretty book, and a very interesting biography of one of my design gurus. But again, I digress. Here are a few more snaps of the Village Pottery. I chose my piece from the wall of green. I think they should just call this the Wall of Margot. The yellows -- a close second fave for me. Such a delightful mellow buttery colour. Suzanne makes her lace pieces by pressing a piece of lace that belonged to her grandmother into the wet clay. Sweet. A two-tone mix that is Suzanne's current favourite. I believe that coffee and tea taste much better in homemade pottery. These are massive and gorgeous and beautifully displayed in an old post office pigeon hole cabinet.